It really is a an awesome feeling to know that I have such great friends. One of my wife and I’s close friend, Halie lives in Colorado, and every now and then she comes back home to good ‘ol San Antonio. For the past two visits, she comes to us bearing gifts of a lot of different Colorado craft beer. She is an amazing artist, and you can see her work on her website, hkoehlerartwork.com. I am always grateful for those who bring me the gifts of good beer! Cheers to Halie! Horns up little lady! Poured into a Branchline Brewing Evil Owl Amber shaker pint glass. This beer is a clear, bright golden color topped with a thin soap bubble like head, which quickly disappeared to nothing, leaving no lacing at all on the glass on the way down. The honey is definitely present in the nose, that’s for sure. Sweet honey hits my nose first, quickly followed by a wheat and cereal grain aroma. There are mild earthy, floral notes, as well as a nice finish of a peppery spice. The sweetness of the honey is what lingers afterwards. The taste follows the aroma exactly the same way. Sweet honey hits the palate first followed by a body of wheat and cereal grains. Hidden behind the grains are mild characters of the added Tettnang hops, coriander, and chamomile. These moderate flavors are earthy, floral, and a peppery spice. Again, just as the aroma, the sweet honey makes its way back to the front, leaving the sweetness lingering around the taste buds. The body is slightly over the medium mark, with mild carbonation. The mouthfeel is smooth and silky, leaving a smooth mouth coating feeling in the throat while the beer goes down. The finish is crisp and a spicy bite, which works well with the sweet honey aftertaste. 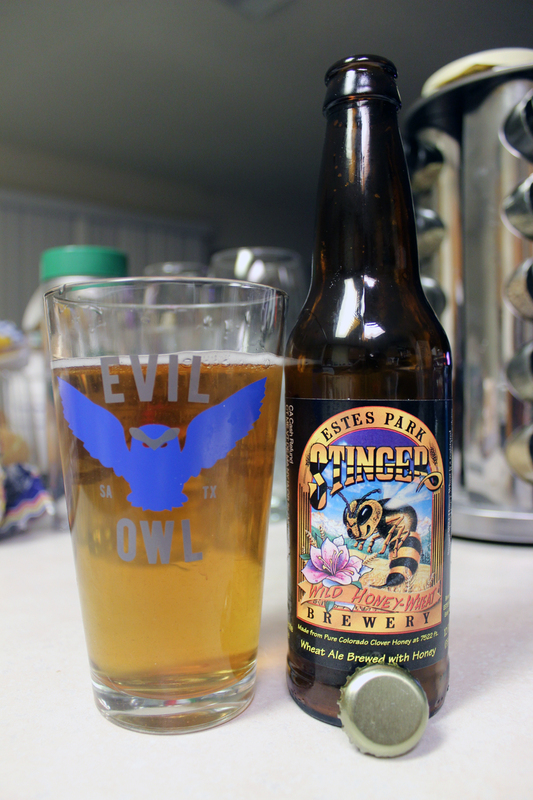 I will say this about Stinger, I enjoyed this beer, but it did not blow me away. It was slightly over average, and I could see myself drinking this beer if I ever came across this again. Estes Park Brewery is not available in TX at the moment, so I was happy to have said that I had this beer. Thanks again to my friend Halie for bringing this beer down to TX for me. Metal Connection: I remember back in High School when I was first getting into Death Metal, one of my earliest favorite bands was Sinister from The Netherlands. I remember the day I purchased their debut full length album, Cross the Styx from a local record shop called Flip Side Record Parlor, which is still open to this day. I followed Sinsiter’s career, collecting each and every one of their 11 full length albums. The band started in 1988, and is still active, with one man being there since the inception of Sinsiter. I am talking about their original drummer, turned vocalist, Aad Kloosterwaard. Members of Sinsiter, especially Aad is a true fan of the Underground Death Metal music scene, as he is always seen wearing a t-shirt of a new and exciting band. Their music has never given into trends. When they had female vocalist, Rachel Van Mastrigt-Heyzer for a couple of albums, she could growl with the best in the scene. I am pleased to have this song, “The Hornet’s Nest”, from their 2010 full length album, Legacy of Ashes as my Metal Connection for this beer. 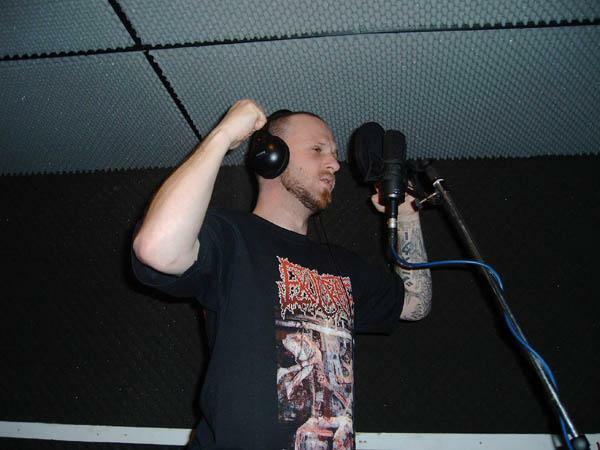 Aad Kloosterwaard wearing one of my old band’s t-shirts during a Sinister recording session. What an honor this was when I saw this photo for the firs time!